Nairobi (HAN) April 27, 2014, The House speaker of Federal Somali parliment has strongly condemned the arrest of its Somali embassy consular to Kenya Siyad Mahmoud Shire who was held in a police detention for several hours on Friday. The Somali diplomat was snatched from his home in Nairobi, Kenya when heavily armed police officers raided his diplomatic and secure home and then took him on a military armoured vehicle. Several other Somali diaspora and business community leaders who were with him at the time in his private home were also detained, according to the Somali Embassy in nairobi. The Somalia Extraordinary Ambassador to Nairobi, Mohamed Ali Nor Ameriko (Somali-canadian) talk to Geeska Afrika Online and told abouit the accident by phone. The Ambassador was extremely deplored about the arrest of the diplomat and embassy consular by the local Kenyan police and that he has sent a complaint letter to the ministry of interior of Kenya on the incident. The Leader of Somali parliament Mohamed Sheikh Osman Jawaari termed the Somali diplomat’s arrest as an ‘agressive’ and unwanted move by Kenyan Government to signal threats against Somalia, Somali People and IGAD security. “It is an irregular act and absolutely against international diplomatic rules that securty forces raid the home of such high profile diplomat” Somali parliament speaker said on Saturday. “We will not accept such intelerable attacks by Kenyan security on our diplomatic mission—I urge the cabinet to send an urgent complaint letter to Kenya and ask why their forces have done such barbaric raid and arrest of the Somali consular” the Speaker accentuated. “We don’t want to play the bilateral relations between the two countries, but w are telling Kenya that Somali government will not accept the continuation of such arrests against our people” the speaker continued. Somalia Minister of Information Mustafa Dhuhulow told HAN & Geeska Afrika Online By Phone that, the Somali Priminister and the government are strongly denouncing the incident where Kenyan Police officials have detained the Somali consular in Kenya. 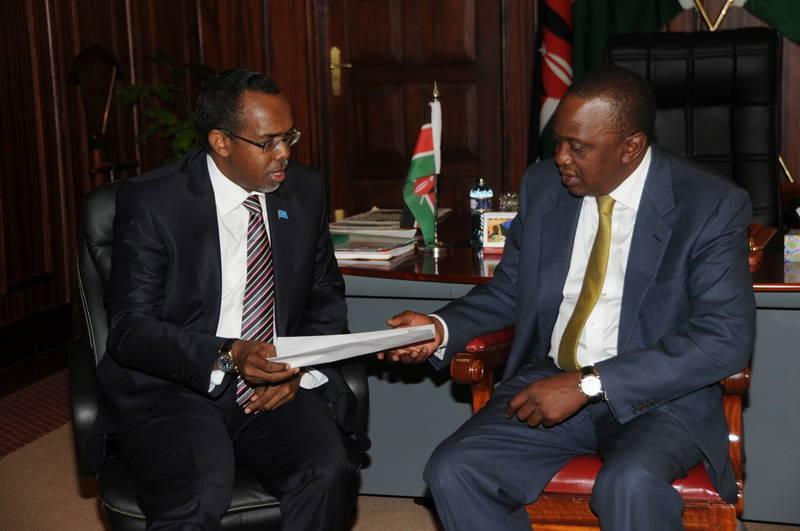 “Cabinet of Ministers in today’s an extra-ordinary meeting have unanimously decided the order of returning Somalia’s ambassador to Kenya Mohamed Ali Noor for discussion and consultation on the incident. Kenya’s police actions are despicable and can’t be tolerated. Kenyan Foreign Ministry is required to give more clarification and clear explanations on why such brutal acts against diplomats are happening in Kenya”,said Dhuhulow. The Somali diplomat and the Embassy consular in nairobi, Kenya H.E.Siyaad Mahmoud Shire was finally released on Friday evening after a marathon efforts by the country’s ambassador to that country Mr. Mohamed Ali Nur (Ameeriko).